Explanation: A comet as bright as Comet Hale-Bopp is very rare indeed. No comet has emitted or reflected this much light since possibly the Great Comet of 1811. However, since Comet Hale-Bopp is across the inner Solar System from us, it does not appear as bright as Comet West did in 1975. 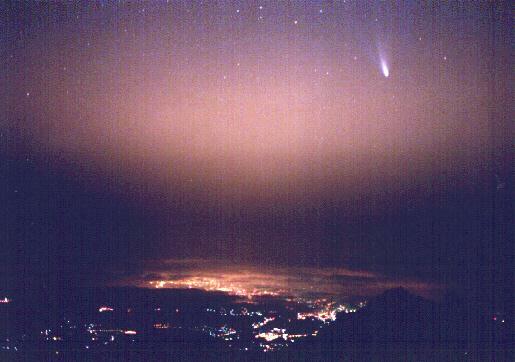 The Great Comet of 1996, Comet Hyakutake, was relatively dim but also appeared bright since it passed close to the Earth. Above, Comet Hale-Bopp was photographed high over the town of Las Palmas of the Spanish Canary Islands, on March 11th.